Geology is the scientific study of the Earth and how it works. You'll learn how our planet and its life forms have changed through time. Well-trained geologists can help the nation and the world chart an environmentally and economically sound course into the future. You'll spend a lot of time outdoors as a geology major, as extensive fieldwork among Southern California's unique geological features will make up a large part of your learning. Your courses will familiarize you with current developments and techniques within the standard subdisciplines of geology. These include mineralogy, petrology, paleontology, structural geology, stratigraphy and sedimentology. You'll work closely with other related disciplines—chemistry, physics, biology, mathematics, and geography—as you expand your knowledge on exploring for energy and economic resources, analyzing geologic hazards, and mitigating the human impact on the environment. A study of the Miocene Ricardo Formation in Red Rock Canyon State Park by a student who now works as an exploration geologist for Exxon/Mobil. A study of the vertebral column of the beaked whale Mesoplodon europaeus by a student who is now pursuing a Ph.D. in vertebrate paleontology at the University of Michigan. Fieldwork is essential to a geologist's education. The coursework in Physical Geology includes hands-on experience in the lab and in the field. The department's trips range far and wide, from overnights in Death Valley to the local hiking hotspot of Wildwood Park. My internship with the Bureau of Ocean and Energy Management prepared me greatly for my next steps after Cal Lutheran. Working side by side with a geologist, geophysicist, and petroleum engineer has given me insight into the industry I couldn't have previously imagined. This experience is helping me prepare for graduate school. 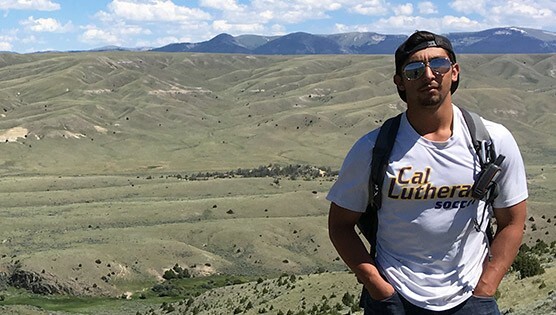 Along with being accepted in graduate schools around the country, many Cal Lutheran geology majors have entered careers in petroleum geology, geophysics and the environmental geology fields. In both the public and private sectors, geologists are hired to study groundwater pollution, earthquake hazards and landslides. They also work in the mining and petroleum industries, or in research laboratories.